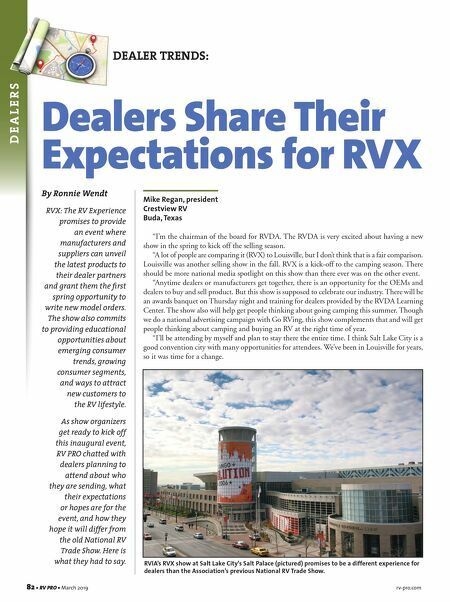 DEALER TRENDS: 82 • RV PRO • March 2019 rv-pro.com D E A L E R S By Ronnie Wendt RVX: The RV Experience promises to provide an event where manufacturers and suppliers can unveil the latest products to their dealer partners and grant them the first spring opportunity to write new model orders. The show also commits to providing educational opportunities about emerging consumer trends, growing consumer segments, and ways to attract new customers to the RV lifestyle. As show organizers get ready to kick off this inaugural event, RV PRO chatted with dealers planning to attend about who they are sending, what their expectations or hopes are for the event, and how they hope it will differ from the old National RV Trade Show. Here is what they had to say. Dealers Share Their Expectations for RVX Mike Regan, president Crestview RV Buda, Texas "I'm the chairman of the board for RVDA. The RVDA is very excited about having a new show in the spring to kick off the selling season. "A lot of people are comparing it (RVX) to Louisville, but I don't think that is a fair comparison. Louisville was another selling show in the fall. RVX is a kick-off to the camping season. There should be more national media spotlight on this show than there ever was on the other event. "Anytime dealers or manufacturers get together, there is an opportunity for the OEMs and dealers to buy and sell product. But this show is supposed to celebrate our industry. There will be an awards banquet on Thursday night and training for dealers provided by the RVDA Learning Center. The show also will help get people thinking about going camping this summer. 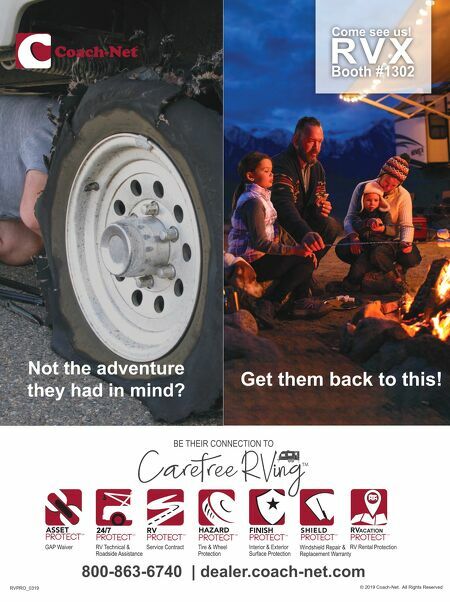 Though we do a national advertising campaign with Go RVing, this show complements that and will get people thinking about camping and buying an RV at the right time of year. "I'll be attending by myself and plan to stay there the entire time. I think Salt Lake City is a good convention city with many opportunities for attendees. We've been in Louisville for years, so it was time for a change. RVIA's RVX show at Salt Lake City's Salt Palace (pictured) promises to be a different experience for dealers than the Association's previous National RV Trade Show.